New research from CDW•G confirms that Common Core preparations are a top-of-mind concern for district IT pros. It’s late June, and for most students around the country, that means one thing: summer break. But for the teachers, principals, IT personnel and other support staff responsible for these students’ education, it’s prime preparation time. With mandatory online student assessments set to begin in fall 2014 for public school districts in the 45 states that have adopted the Common Core State Standards, school leaders are working overtime to ensure that their networks can handle the load, that they have enough computing devices on hand for students to complete the tests, and that teachers and staff are properly trained in how to administer the assessments. The resulting Common Core Tech report, released during a Monday morning session at the ISTE 2013 conference, summarizes how survey respondents are working to ensure that their schools and districts are technologically equipped to handle the new online student assessments that align with the standards; what most concerns them about the standards; and the effects they believe the standards will have on instruction and overall operations. Dr. Geoffrey H. Fletcher, deputy executive director, State Educational Technology Directors Association (SETDA), Glen Burnie, Md. CDW•G’s Julie Smith (from left), Doug Renfro of Metropolitan Nashville (Tenn.) Public Schools, Joanna Antoniou of Passaic (N.J.) Public Schools and Dr. Geoffrey H. Fletcher of the State Educational Technology Directors Association participated in a session on Common Core IT readiness during the ISTE 2013 conference on Monday, June 24. What Are the Benefits of Common Core? According to the Common Core Tech report, three-quarters of the IT professionals surveyed expect Common Core to have a positive impact on their district. The majority of those respondents (81 percent) cite, among the anticipated outcomes, on-demand student data analysis. Other anticipated benefits include new classroom technologies (79 percent), improved classroom technologies (78 percent), improved teacher instruction (78 percent), improved data management (77 percent) and improved student engagement (76 percent). In fact, more than half — 56 percent — of the computers registered through the Technology Readiness Tool co-developed by the Partnership for Assessment of Readiness for College and Careers (PARCC), the Smarter Balanced Assessment Consortium, SETDA and Pearson “are still running Windows XP — an operating system that Microsoft will stop supporting in 2014.” That, he says, means there’s still a lot of work to be done. CDW•G’s survey findings reflect that district IT professionals understand this all too well. Despite a barrage of competing IT needs, 83 percent of respondents call preparations to meet the technology requirements of Common Core one of their top three priorities. Nearly three in 10 respondents (29 percent) cite it as their top priority. For both Metropolitan Nashville Public Schools (MNPS) and Passaic Public Schools, making Common Core a priority begins with professional development. Move forward confidently. Strong infrastructure is a must to ensure teachers can move forward confidently, so update and upgrade before bringing in new technology. Share your vision. Change is hard. Develop and communicate a strong vision to all stakeholders to ensure everyone is speaking the same language. Focus on instruction and good teaching. It’s not about a device, which should be transparent. It’s about the instructional shift that makes students active participants in learning so that they take ownership of their education. Prepare for more change. In a year, your program will look very different. Continue to use pilot groups or leaders to share best practices and borrow ideas that unify your vision. For more from the report, visit CDWG.com/CommonCoreTech. There are concerns, of course. As CDW•G’s survey notes, district IT leaders worry that they don’t have the budget (76 percent) or the IT staff (69 percent) to support the increased technology needs that Common Core requires. Also troubling many of them is whether they have the technology in place to support online student assessments (62 percent), whether classroom technologies for instruction are adequate (60 percent), if the existing IT infrastructure is strong enough (55 percent) and if existing wireless access is reliable enough (55 percent) to handle the influx once the first testing sessions commence next fall. Asked how they’re overcoming these challenges, SETDA’s Fletcher pointed attendees to an array of resources on the association’s website, at setda.org/web/guest/assessment. The CDW•G survey also asked respondents to identify how their districts will administer online testing when the time comes. Nearly eight in 10 (78 percent) of them indicate that their districts plan to test students in shifts. Just 20 percent aim to test all students simultaneously. What’s more, such testing will be conducted in a variety of ways. Given several methods from which to choose, 75 percent of surveyed IT leaders say they will rely on traditional computer labs. But some will mix in (or rely exclusively) on other delivery mechanisms, such as carts stocked with notebook computers, tablets or other computing devices (37 percent); traditional PCs (37 percent), cloud computing (30 percent), one-to-one programs (29 percent), bring-your-own-device programs (17 percent) and virtual desktops (9 percent). 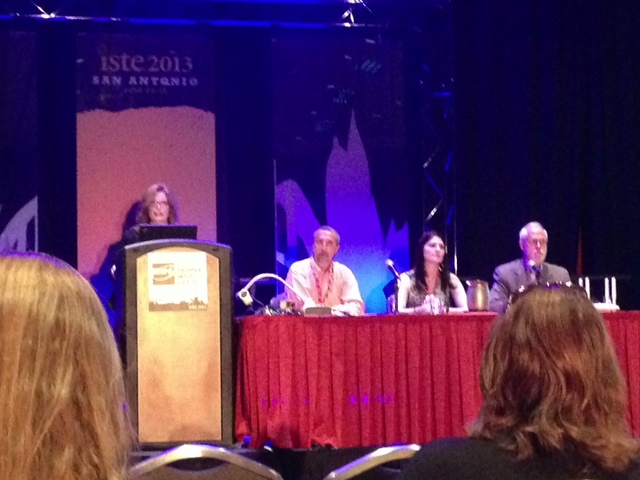 For more updates from ISTE 2013, follow our ISTE 2013 conference hub for articles, videos and more.